CTbites is pleased to welcome Eliza Schlesinger as a new contributor. She will help guide our readers to great tasting venues perfect for 20-somethings in the Stamford area. [UPDATE: This restaurant has closed] When the weekend night bar scene in Stamford comes to a close, a girl has two options, take home a man or take home a sandwich, and this single lady prefers a sandwich. As my friends and I were finishing another night of laughter and dancing, I looked around to see if anything caught my eye. I peered across Bedford Street and instantly had my answer, the Melt Mobile. 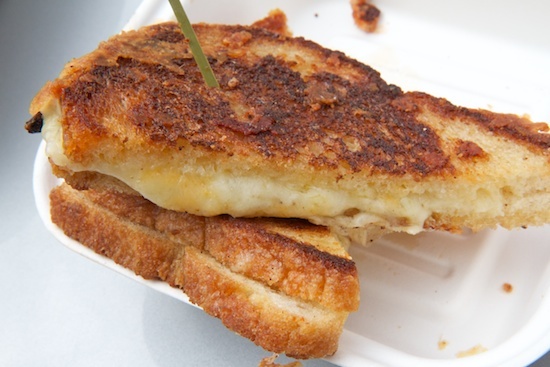 As a little girl, there were few things as delicious and comforting as a grilled cheese, and Melt Mobile’s creations bring me back to my childhood while igniting the flavors that my adult taste buds love. The scene is exactly what I would expect around 2 am, utter drunken chaos and sloppy flirtation combined with an aroma that makes it all bearable. Until this visit I’ve always ordered the same sandwich, the Caprese, for two simple reasons. The first, it’s typically listed towards the top of the Specials menu, and the second because I swear it’s always tasted like heaven. The sandwich is a wonderful balance of fresh mozzarella and Prosciutto di Parma, accompanied by my favorite combination of roasted red peppers, arugula, fresh tomatoes and pesto aioli on Kalamata olive bread. But I am here to be objective and thorough, so I let my eyes wander down the rest of the deliciously cheesy menu to look for new and exciting options. The Original Melt is an obvious choice, described as a house blend of Gruyere, Monterey Jack and Tillamook Cheddar on Country White Bread. My apartment-mate and I excitedly try to decide on a second choice to take home, when I am interrupted by another ‘Melt Mobiler’ who clearly thinks I am part of the late night options. “So, what kind of sandwich are you getting?” he asks. Before I can even answer, he insists that I would love the Meatball 3 Cheese Squeeze (Diana’s Meatballs in Marinara, Fresh Basil and Mozzarella, Pecorino Romano and Reggiano Parmigiano on Tuscan Bread) because it is almost as good as his mother used to make for him growing up. Clever girl that I am, I suggest that if he gets a Meatball Squeeze I will be happy to have a bite and see if his taste in sandwiches is up to par with his taste in women. He was quite right and I was happily impressed with the seasoning of the meatballs accompanied by the proper balance of Italian cheeses. The meatballs are warm in temperature, soft in texture and flavorful but not too spicy. However ladies, I would warn against ordering this sandwich while wearing any of your favorite outfits. As delicious as the marinara sauce and melted cheese was, they tend to be quite messy and end up as much on your hands as in your mouth. I bid adieu to my new “friend” and it was finally my turn to order. “I’ll take an Original Melt and the Svelt Melt please?” The Svelt is a logical counter-calorie balance to the Original. Listed at 350 calories, the combination includes oven-roasted Turkey, Lowfat Jarlsberg, Roma Tomatoes, whole grain Honey Mustard grilled on 7-grain bread. Back at the apartment, my apartment-mate and I savor our two choices. The Original oozed cheesy greatness while holding to the innocence of a classic grilled cheese. With nothing to interrupt the butter, bread and cheeses, the Original is a classically delicious choice. While I personally have always been an American cheese fan, I admit the melted Gruyere was a welcome change and something I may even be tempted to try to recreate at home. The ingredients in the Svelte may say it’s healthy but it tastes quite naughty. True to the description, the turkey is oven-roasted and the Jarlsberg abundant enough that you will forget this is a healthier treat. The tomatoes were a nice addition, however I would have preferred cherry tomatoes, or some chopped Roma tomatoes for easier eating. My only other suggestion would be raw or slightly grilled onions to counter-balance the sweetness of the honey mustard. As we finished our sandwich finale, we were interrupted by a text and a final plea from a hopeful friend to hang out, to which we instantly responded, “Sorry, we’ve already got our Melt Mobiles and are in for the duration.” It is safe to say for now, that a Melt Mobile sandwich is the winner in the end-of-night roulette.